Peppermint (Mentha Piperita) is of the most widely used herbs for flavoring and its menthol content. Peppermint may be used for helping the body with colds, bronchitis, diarrhea, gastritis, enteritis, indigestion, nausea, intestinal gas, bloating, griping, colic, colitis, heartburn, irritable bowel syndrome, gallstones, stomach spasms, vomiting and ulcers. As directed by your doctor. 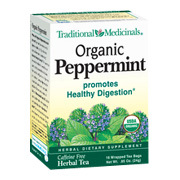 Organic Classic Peppermint Tea - is shipped in a discrete, unmarked package. Orders are processed immediately and usually take about 3 to 5 working days to be received. We do ask that you try it for 2 to 3 weeks to feel the full effects. Any information received is used only for order processing and shipping purposes. Your information, such as e-mail address, will never be disclosed to a third party.